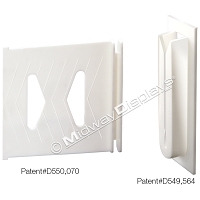 Shelf Support Tubes and Shelf Support Clips | Made in the USA | Midway Displays, Inc.
Design your corrugated POP Retail Displays with confidence. 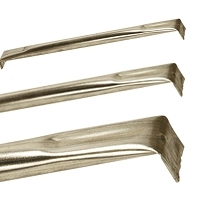 Our shelf support components offer your designs strength and support inconspicuously. Custom colors available for shelf support tubes and our shelf support clips are hidden within the corrugated board. Corrugated Components & Devices offers the industry standard for maximum shelf support under your corrugated shelves with our Soft Flow Forming Shelf Support Tubes, custom made to your specifications. Add strength to your corrugated P.O.P. Display shelves with our ½”, ¾”, and 1" Diameter 28 Gauge Lock Seam Steel Tube in a semi-bright finish. Turndowns are available in ½”, ¾”, and 1” lengths, and, tubes can also be ordered without turndowns. 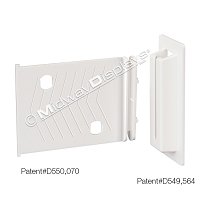 We also manufacture our patented plastic shelf support clips in Chicago Illinois! Our hidden shelf support clip design, offered in two sizes, adds strength without unsightly fixtures. Our patented design has many unique features which add strength and ease of assembly, reducing your set-up time! All our products are manufactured in the USA.